Most of the images found on this page, were taken by members of the Gibson family, from St Mary’s. Several generations of which have recorded life on these islands; allowing us to look back and see how the thatching hereabouts differed so much, from that in the rest of Cornwall. 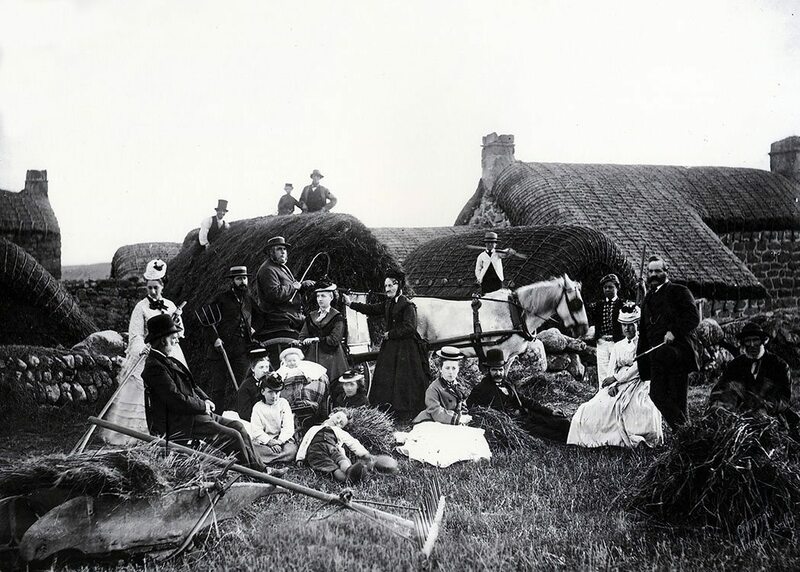 Yet the Channel Islands; further south and almost as exposed to Atlantic gales, use the Standard method of thatching. This difference, in style and method, was due entirely to a lack of resources. 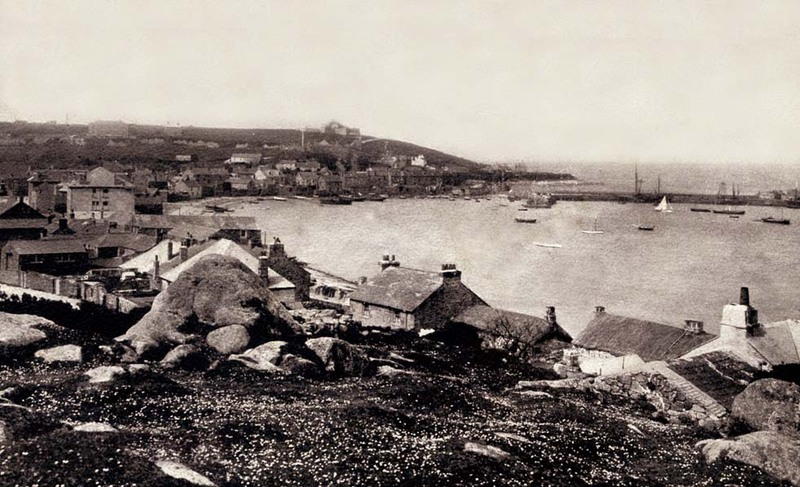 The islands that make up the Scillies, are much smaller than Jersey or Guernsey, and there was never enough surplus cereal straw to cover the roofs in a standard fashion. Importation was obviously too expensive. 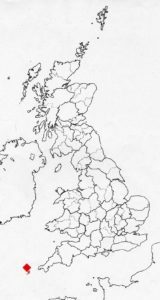 This, coupled with a windy climate, created conditions more common to the very north of Britain. The solution being the same roped thatch, renewed every few years; as used in these higher latitudes. The islands roofing was commented on by various travellers. 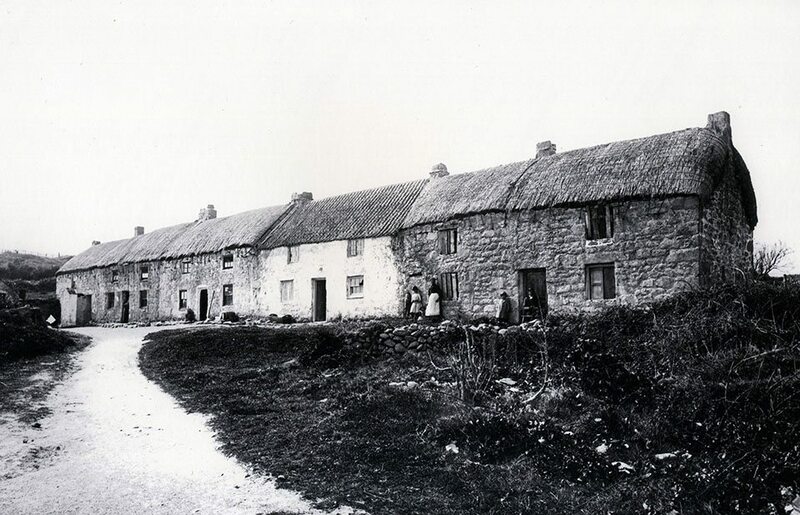 The Italian, Duke Cosmo, visited Scilly in 1669 and was intrigued by the cottages he saw. ‘The more common ones have a peculiar sort of covering…. having nothing but a simple mat spread over the rafters, drawn tight all round, and fixed firmly to the top of the walls. 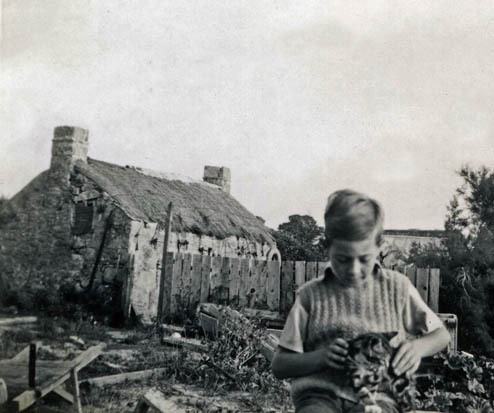 This they say, is the sort of covering commonly used in Bermuda, and it is necessary to renew it every year.‘ So it would seem that the thatcher’s art had changed little, in the two centuries until the Gibsons started their photographic record. I doubt if there was much influence, from Bermuda, on Scilly’s thatching, as his grace suggested; but ships and ideas may well have come from other directions. In the century after the good Duke’s visit, a Mr Heath records a similar situation, in 1750. ‘…the method of covering is with a thin coat, when harvest is over, and they begin thrashing their corn’. A look at the photographs show that the roofs are not that thin, it would seem a top coat was added, as and when deemed necessary; not much old thatch being removed. Mr Heath also notes the method of roping used as ‘… straw rope crossing one another in a figure like the glass windows.’ The square shapes he suggests are visible on the pictures and refer to leaded window panes; a common sight, to an eighteenth century writer. Thatch existed on most of the islands, at the time of the Revered Woodley’s perambulations. 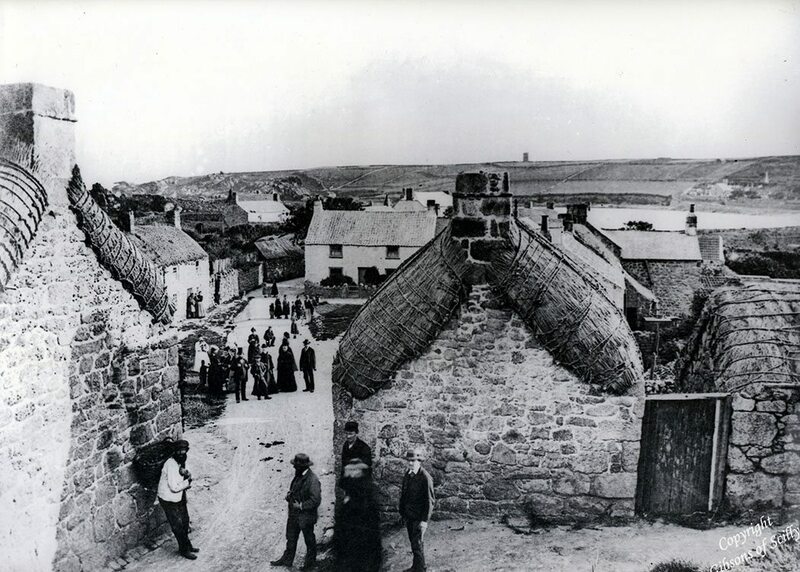 In Hugh Town the largest settlement, on St Mary’s; ‘the walls are low, and many of them covered with thatch… occupied by mechanics, inn holders and tradesmen…’. 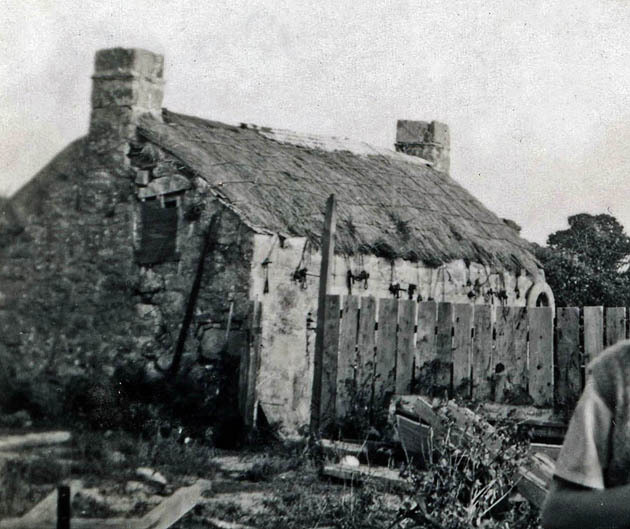 The original church on St Martin’s was thatched, ‘20 feet long with walls 7 feet high’. 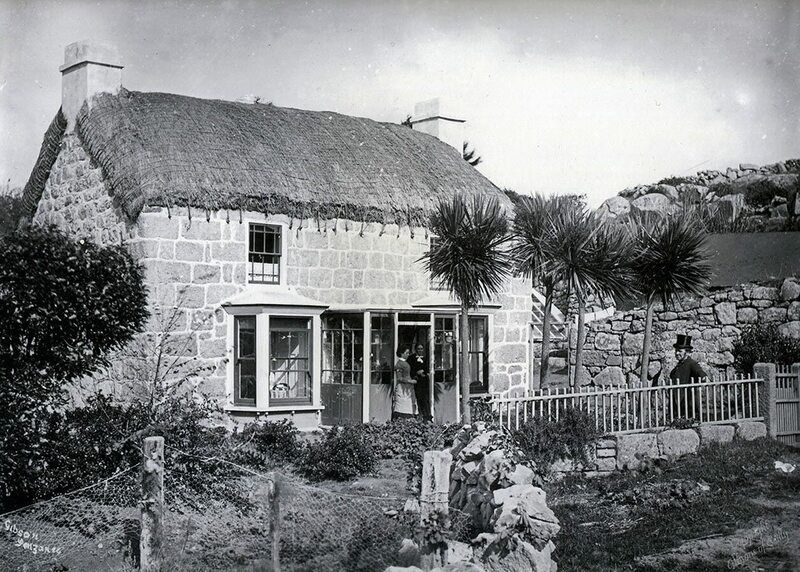 And on Tresco, the ‘principal village… contains about a dozen houses… they are nearly all covered with thatch’. Fashion historians would love this picture, but to us the gent in the top hat, on the rick is of more interest. He seems to be in the process of thatching, over that years hay harvest. The hay itself is being used as a covering, not the best material, as it soaks up water as well as shedding it. Showing how limited the supply of better thatching materials must have been. Both ricks and houses are thatched with the same method, if not material. A view of Old Town, St Mary’s. The roping down seems very professional, but this is not surprising, in a community used to ships and the sea. The straw ropes, mentioned by early writers have gone. A close proximity with the sea, in the age of sail, would have yielded a vast amount of, longer lasting hemp substitutes. The ends of the material, used around the chimneys, seem large and the thatch is quite long; this could be water reed, from small local reed beds. An Edwardian view of St Mary’s. Beyond the flower strewn foreground, on the right, are two waterside thatches. Now in a minority hereabouts. Old Grimsby, Tresco. The rot has set in and one family already sleeps under a roof of pantiles; perhaps not used to the change they have a horse shoe over the door for luck. A large piece of wood holds next door’s ropes secure against the tiles, maybe an old ships timber. They were used extensively, as timber along with thatch, was a scarce resource on many islands, both in the north and here, in the far south west of Britain……….